Ebony Marshall is in her final year of high school. Five months, two weeks and four days... She can't wait to leave the town where she's known only as Black. Because of her name, of course. But for another reason, too. Seventeen year old Ebony Marshall, social pariah and simply known within her small country town as Black. In her final year of school, Ebony works part time at the local water treatment plant, her father's own enterprise that provides clean water for the region. But Black has always lived her life on the fringe, the girl for who tragedy defined her and left her ostracised by her community and peers who believed ebony is damned. All except new student Aiden. Aiden has heard the rumours, but befriends ebony against despite the dire warnings of the curse of Black Marshall. As the teens form a tentative friendship against all odds, Aiden is hospitalized. Only this time, the curse of Black Marshall has taken a dangerous direction with deadly consequences. The Pure Apostles fuel the fears of the Whispers, a devoted group community members who follow the teachings of Father Ratchet. Five months, two weeks, and four days is all that separates Black and freedom, freedom from the Whisperers and small town ideals. Until the Pure Apostles see Ebony as a threat. Fleur Ferris is spectacular. 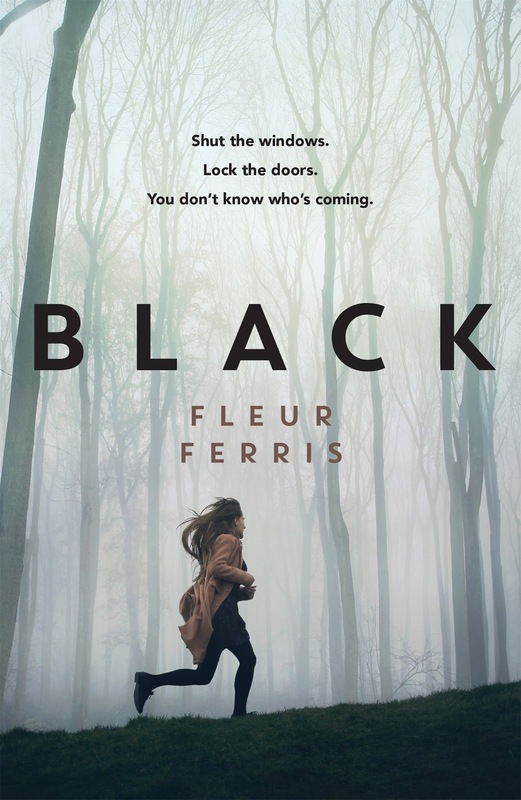 Black was a brilliant blend of a contemporary, mystery and exploring small town prejudice and one girl's fight to live. Ebony Marshall's young life has experienced devastating grief, but yet the seventeen year old is still able to hold her head high despite now being a social pariah. Once affectionately known as Black, now it holds negative connotations after losing multiple friends in devastating accidents. Her only friend is her work colleague Ed, only a few years Ebony's senior and someone who has never judged her as others have, as a curse and plight on the small community of Dainsfield. What endeared me to Ebony was her determination and resilience. She's been subjected to the taunts of her peers and given a wide birth by the community since losing her small group of friends at such a tender age, labelled as a curse and unable to grieve for all she had lost. Ebony refuses to be bullied or belittled, especially against those who the Pure Apostles have convinced Ebony is a threat to their children and community. It's after Ebony begins to develop a relationship with new student Aiden when the Whisperers begin an aggressive campaign against the teen, when an accident sees Aiden's life holding by a thread and the small town of Dainsfield begins to unravel. The Pure Apostles are a religious cult, with a history devoted to exorcising demons. Ebony has been labelled as a threat since conception and as the secrets of Dainsfield threaten to erupt, Ebony will need to fight or risk becoming yet another urban legend. The Whisperers were undeniably alarming, following the teachings of Father Ratchet who is the driving force behind the curse of Black Marshall. Ebony is watched, monitored all by a group who remains anonymous, leaving the reader unaware of which characters belong to the unhinged congregation. Ebony's storyline may be fictional, but all too similar to cases all over the world where religious leaders have faith cleansed parishioners in similar circumstances, giving Black's storyline an eerie and unsettling emotive. Although Incredibly disturbing, Black was completely riveting. I was unable to tear myself away from Ebony's narrative and the town of Dainsfield brought to life. Fleur Ferris is a remarkable storyteller, sharp, accomplished and confident. I loved the unpredictability. It left me feeling unsettled and reading long into the night. Absolutely compelling and I loved every moment. Ooooh you had me at "cults" and "disturbing". This sounds SO GOOD. It sounds like the atmosphere is incredible too- any book that can leave you feeling unsettled after you've finished is solid, in my opinion! Thanks so much for putting this on my radar- now I just have to find a way to get it in the US! Fabulous review! You should be able t pick up a copy on The Book Depository Shannnon, even better if one of the US publishers picks it up. It's incredible. Oh, my. This sounds so good! I've a feeling it won't be available in my neck of the woods. Bah. I love the idea of a cursed girl shunned by everyone. Hoping she'll end up gloriously burning the whole town in the end. Lol. I was championing her on Joy, taking them all out Carrie style. It's incredible and hopefully it's available on Amazon or The Book Depository soon. This sounds awesome!!! I hadn't heard of it before so I'm glad to hear about it. It totally was Jill, such a brilliant read that will have you reading long into the night. Wow I hadn't heard of this book before, but I'm definitely interested. Even though cults can be creepy, I find them to be really interesting and this one sounds extremely creepy & disturbing. I'm intrigued to find out about this so-called curse and what's actually happening with Ebony & this strange cult. I love books based on cults too Amanda. They add that extra element of creepiness to a storyline and are completely engrossing. Black is incredible, I couldn't put it down! Black is sitting on my shelf waiting to be read and I'm now thinking that I will have to move it further up my list. AND! make sure I stock up on some comfort food before I read it :-) :-). YES! Move it up and read it next Sarah. We have very muchly to discuss! This book sounds really good. I love it when I can't put a book down. I don't know how this book escaped my radar. Great review! Thanks Karen. Such a brilliant read. I hope you can grab a copy soon, would love to bear what you think of it. Ohh she's a tough cookie and although she used to allow the bullies to bring her down, but Ebony's so strong and resilient as a result. It was brilliant, one of my favourite reads this year. This sounds like something I won't be able to put down for a moment in case I miss an incredible turn in the story. Wow. What a scary concept but also one that really gives itself to fiction novels I guess. I'm excited about this one. Actually, there's been known cases of similar incidents of cult like organisations exorcising demons. Terrifying stuff. It was brilliantly written Mawa, unputadownable. Ohh, this sounds so good! Wonderful review :) I enjoyed Risk, but I've heard people say this is even better and that makes it a must-read for me!